Former Air Force Space Command leader General John E. Hyten has accepted the command of the US Strategic Command from Navy Admiral Cecil D. Haney during a change of command ceremony at Offutt AFB, Nebraska, on November 3rd. 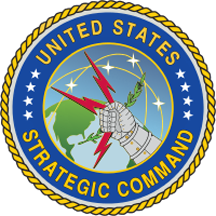 While the commander at Air Force Space Command, from August of 2014 to October of 2016, he was responsible for organizing, equipping, training and maintaining mission-ready space and cyberspace forces and capabilities for North American Aerospace Defense Command, STRATCOM and other combatant commands around the world. 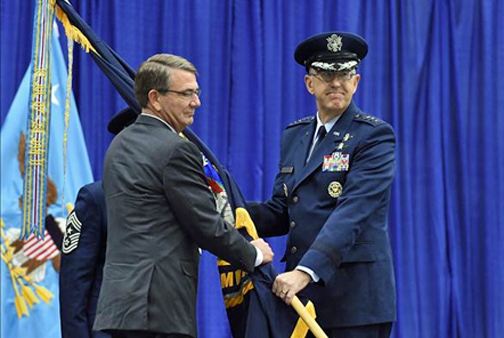 Gen. John E. Hyten, accepts the command guidon from Secretary of Defense Ash Carter as he takes command of U.S. Strategic Command during a ceremony at Offutt Air Force Base, Neb., Nov. 3, 2016. Carter presided over the ceremony and provided remarks during which he congratulated Hyten on his appointment as the new STRATCOM commander. Hyten previously served as commander of Air Force Space Command. Photo is courtesy of US Air Force/Staff Sgt. Jonathan Lovelady. As the new commander of STRATCOM, Hyten said he is honored to follow in the footsteps of “some of the greatest leaders in the history of our country. In recent years, the leaders of USSTRATCOM have been heroes and mentors of mine. Most recently that meant (retired Air Force Gen. Kevin P.) Chilton, (retired Air Force Gen. C. Robert) Kehler, and Haney, but there were many other heroes of mine before that. I know I am not their equal, not even close, but I am motivated to try to live up to their legacy. To each and every one of the amazing joint warriors of this command, the Soldiers, Sailors, Airmen and Marines of U.S. Strategic Command, from all across our nation, and to our allies—who stand with us against the most dangerous threats on the planet—I pledge my best efforts to support you each and every day I am lucky enough to be allowed to command this incredible organization." Hyten said he observed how “life seems to come full circle so often in ways you never expect,” noting that 20 years ago, he and his family moved to Offutt Air Force Base, Nebraska, when he assumed command of the 6th Space Operations Squadron. “It was a special time both in my career and our lives. We loved that squadron, and we were so impressed with how the local community reached out and took care of us. We had a group of incredible Airmen and families, and we together accomplished some amazing things. And now, once again here we are. We’ve just packed and moved again from Colorado Springs to Nebraska to take command once again—this time of a slightly larger, slightly more complex organization in United States Strategic Command." Hyten attended Harvard University on an Air Force ROTC scholarship, graduated in 1981 with a bachelor's degree in engineering and applied sciences, and was commissioned a second lieutenant. Hyten's career includes assignments in a variety of space acquisition and operations positions. 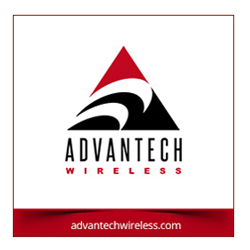 He served in senior engineering positions on both Air Force and Army anti-satellite weapon system programs. Admiral Haney will retire from active duty in January after 38 years of service.